“Today, professionals are working in the office as well as from home and on the go,” says Theis Mork, Vice President of Product Management at Sennheiser Communications. “Flexibility is more important than ever. 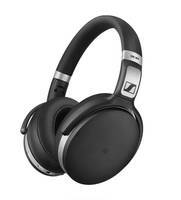 Sennheiser’s MB 360 UC headset supports the modern style of working, enabling its users to work just as well on the train, at the airport or in a café as in the traditional office space. The sleek modern design and foldable easy-to-store headband will appeal to the style conscious worker. In addition, the refined sound for music makes working as well as commuting much more enjoyable”, explains Theis Mork.